This is a post prepared under a contract funded by the Centers for Disease Control and Prevention (CDC) and written on behalf of the Mom It Forward Influencer Networkfor use in CDC’s Be Antibiotics Aware educational effort. Opinions on this blog are my own and do not necessarily reflect the views of CDC. As moms, it seems we have an intuition to know the right thing to do when our children are sick. We want them to get the best care, whether it’s at home resting with a common illness like a cold or at the doctor’s office. Dealing with sick children can be tough, and often parents may not be aware of the possible side effects of medications. We may even pressure our healthcare professional to prescribe an antibiotic, not even knowing what antibiotics do and don’t treat. That’s why I’m excited to provide information about CDC’s Be Antibiotics Aware educational effort and share helpful tips for your family’s health. When you use antibiotics correctly, you’re doing what’s best for your health, your family’s health, and the health of those around you. Did you know that antibiotics actually treat bacteria, and they don’t treat viruses? Antibiotics do not work on viruses that cause colds and flu, bronchitis, or runny noses, even if the mucus is thick, yellow, or green. 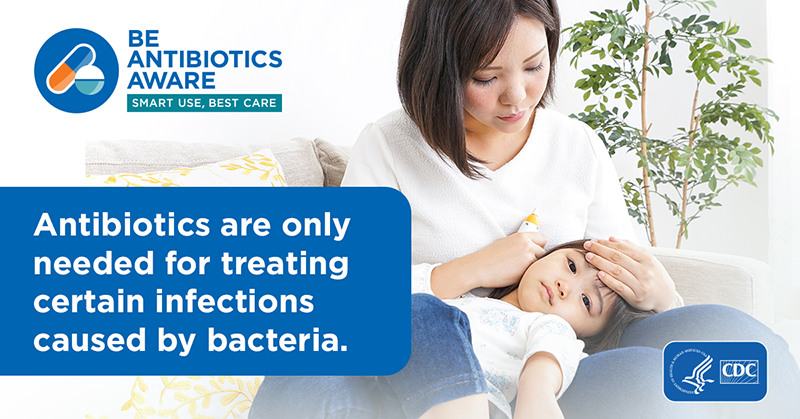 Antibiotics are only needed for treating certain infections caused by bacteria. 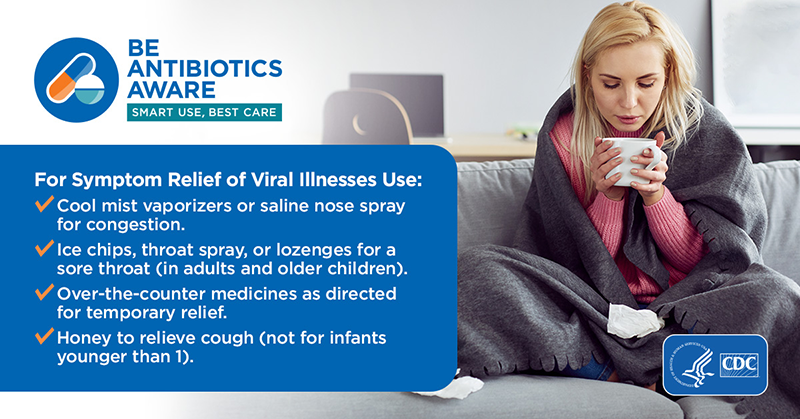 Antibiotics also won’t help some common infections caused by bacteria, including many sinus infections and some ear infections. An antibiotic will not make you feel better if you have a virus. Respiratory viruses usually go away in a week or two without treatment. Ask your healthcare professional about the best way to feel better while your body fights off the virus. 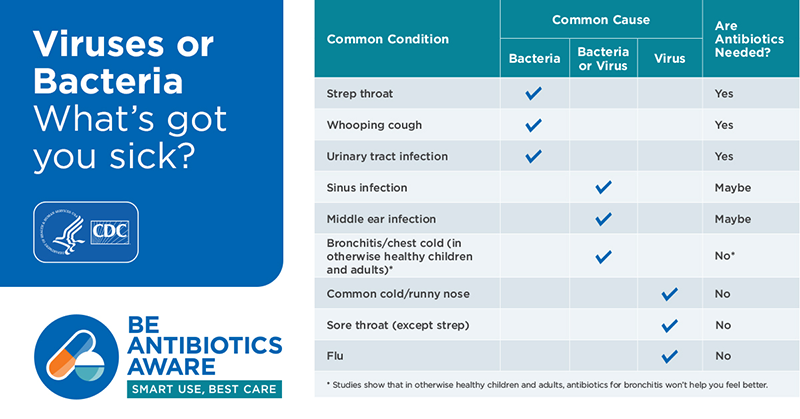 This graphic shows common illnesses that antibiotics treat. Side effectsrange from minor to very severe health problems, such as a rash or Clostridioides difficileinfection (also called difficileor C. diff). When you need antibiotics for an infection, the benefits of the drug usually outweigh the risk of side effects. Antibiotic resistanceis one of the most urgent threats to the public’s health. Antibiotic resistance does not mean the body is becoming resistant to antibiotics; it means that bacteria develop the ability to defeat the antibiotics designed to kill them. Each year in the United States, at least 2 million people get infected with antibiotic-resistant bacteria. At least 23,000 people die as a result. Antibiotics are critical tools for treating people with serious and life-threatening conditions like bacterial pneumonia and sepsis, the body’s extreme response to an infection. But antibiotics aren’t always the answer. Everyone can help improve antibiotic prescribing and use. This is why it’s so important for parents to Be Antibiotics Aware.